There have been two minor victories for the good guys in the politics of F1 over the last week or so. The first has been FOTA's cutting through Mosley's bully boy tactics of the threatened standard engine so that a reasoned and realistic debate can commence on the future of the sport. I will say nothing regarding the measures already apparently agreed as Mosley is quite capable of throwing all that away if he feels he needs to re-assert his power. But it is a beginning, at least. The other was the curious affair of the Canadian Grand Prix. This began with the omission of the race from the FIA's calendar for next year - made without prior announcement or explanation. Naturally, this had the fanbase up in arms and Bernie was moved to explain that it was the result of "irregularities" with the contract for the race. Later it came out that it was about money, of course, and Bernie was adamant that the race would not take place since the organizers had not made all the payments due. That was pretty much what we have come to expect from Mr Ecclestone but the next event in the drama was entirely unexpected. 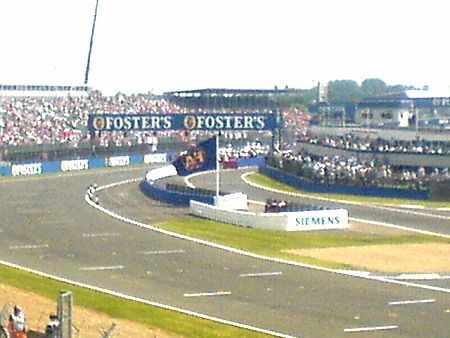 The Magny-Cours organizers announced that they would not be hosting the French GP in 2009. Suddenly Bernie found himself confronted with a completely new scenario; someone was having the temerity to turn his own tactics against him. He was livid that one of his cards should be so rudely snatched from his hand, especially as the organizers made it clear that his exorbitant fee was the cause of the cancellation. The calendar was down to seventeen races and it dawned on the little impresario that this could easily be the first of many withdrawals by European organizers. When you are losing money annually and being constantly squeezed for more, there must come a point at which you decide enough is enough. This demanded a re-think and it seems to me that it is no coincidence that, from being definitely off for next year, the Canadian GP is back on the agenda. Talks are going on between the Canadian organizers and Bernie, which is what should have happened in the first place. I must admit to enjoying the irony of the situation. So we have two small victories, Mosley forced to take a more reasonable attitude and Bernie hoist by his own petard. But these might be indicative of a changing climate in the sport with Mosley's favorite bogeyman of the moment, the credit crunch, looming over everything. The manufacturer teams have at last realized that the only way to get the FIA to act sensibly is to present a united front, insisting on practical solutions rather than the wild excesses so beloved of Mosley. And the Magny-Cours organizers have pointed out something that has always been true: you do not have to pay Bernie's price if you don't want to. Imagine if several other GP organizers were to realize that all this pain is really not worth it. Bernie could be left with precious few races with which to meet his commitments, the prospective new Asian races not being ready yet and creditors beginning to become insistent. The fact is that Bernie needs the existing GPs more than they need him. For some time the main selling point for a GP has been the national prestige it brings, not the profit margin (which hardly exists for most races). And only the boom economies and dictatorships of Asia can afford the kind of money Bernie needs to pay back CVC's creditors. If the European GPs start to drop out instead of acquiescing to ever-increasing demands for more money, Bernie can forget his dreams of twenty GPs a year - he will be hard-pressed to keep the numbers close to the present 17 or 18. With the British GP's future very dubious, Hockenheim muttering about not being able to afford to run a GP and Valencia a monumental flop, it seems that Bernie's reign as puppet master may be coming to an end. There suddenly seems too little time to get the Indian, Korean and Russian GPs up and running and power has shifted to the owners of the older circuits. So Bernie will be talking seriously to the Canadians - he needs them now, even if the manufacturers were not putting pressure on him over the North American situation (as I am sure they are). I think we will see the Canadian GP re-instated on the 2009 calendar. As I have pointed out before, less money than you wanted from a race is still better than no money at all. Not only that, however. If the power in the sport has shifted as I suggest, when the Donington GP proves entirely unworkable, we may even have the happy prospect of Bernie going back to the Silverstone organizers, cap in hand and begging for a GP at any price. Now wouldn't that be something worth waiting for? Bernie, Max and the FIA are all bullies whose confidence has increased with their victories over time. As we all know, the only way to treat school-yard bullies was to publicly drive them into the ground like a tent -peg - and if one person was not sufficient, then use as many as necessary to accomplish that end. Sadly, Canada ran to Bernie on bended knees and that never ever works with bullies, it merely postphones the punishment. France recognized that failure and acted accordingly. Where are the other countries when they are needed to support France by canceling their own overpriced venue till the current management is fired and sanity returns to the series? Where are the manufacturers who can surely take advantage of this chink in the armour to eliminate the threat of failed management forever and return F1 to a truly competitive series where the best wins - unhampered by the FIA, their library of rules, and their team handicaps through tire manipulation and biased stewards? I suppose it goes without saying that such a unified attack will not happen, so the only chance for improvement lies with the current credit crunch, but will that last long enough to be truly effective? I think not! I think you cannot count the the FOTA/Mosley meeting as a victory. Max never intended there to be standard engines that was simply a negotiating ploy. Whether the final result was a victory or not we will have to wait and see. If I was a GP owner I would be forming an association of GP owners and negotiating en bloc. If Bernie doesn't want to play ball wait until the season has started and cancel 6 races on him. Bring the little toad to his knees. I hear what you're saying, David, but am slightly more optimistic than you. Whilst it is true that the Canadians were put into panic mode by the loss of their GP, the cancellation of the Magny-Cours gives them leverage that was not there before. If the Canadians are watching events, they must realize now that Bernie can no longer scratch their race from the calendar so blithely - he needs it. They need to use that fact to get their race back on reasonable terms. That, surely, is a minor victory. The manufacturers have been slow to realize their potential power to stabilize the rules of F1 but I think the events in the recent meeting will have shown them how effective they can be. With reference to Steven's point, I agree that standardized engines was a bargaining counter only but the extent to which Mosley has listened and had to give in to the manufacturers' proposals is very telling. He rejected their previous suggestions out of hand and introduced the engine freeze as "punishment", if you remember. I am quite sure that his more reasonable position now is caused by his need to rehabilitate himself after this year's sordid scandal but it is a sign of the increasing power of the teams, whatever the reason. As long as FOTA retains its unity, they can be a strong influence to at least temper Mosley's destructive impulses - and the recent meeting was the first indication of this. There are a lot of "ifs" in all this but, for the moment, I see it as a small victory of sorts. Steven: C’mon now. Why demean our Anuran population? There’s not a toad in existence foolish enough to return to the same incompetent barber year upon year. The Canadian GP is not a done deal. Those who met with Ecclestone are elected politicians. They will not accept deals that will put their political popularity at risk. If it is possible to put together a package that won't have constituents up in arms and that won't go into serious debt in the manner M.Legaut has, over the past few years, there could be a race. These politicians aren't race fans, they are in it for the money, same as Ecclestone. If Ecclestone tries his usual extortion, I doubt if there will be a race. In one way I would quite pleased if they told him to shove it. Although this seems unlikely there is an affinity between Quebec and France and this wouldn't be the first time they stuck together on an issue. It`s oh so ugly, when I was protesting that the Olympic GB Team should boycott the Beijing Olympics all I got in return was "Dont mix politics with sport". Yet we have a sport that is run by the politically minded, ie `Iam alright Jack, pull the ladder up`sort of people, if we forget that all politicians are crooks ( from Rockafella to Mandleson) and in the beginning most of there power was obtained with the gun, today they just throw there weight around and the cowering masses capitulate because `thats just the way it is`. Lets just pray that its the begining of `Give them enough rope and there hang themselves` otherwise thousands of Tibetian monks and a Sport I love will of died invane. I think auto racing will be around as long as there are wheels. F1 may die but it will quickly be reincarnated under another name. Car racing existed long before these two clowns and the clown before them, (Balestre) although he doesn't seem quite so bad anymore. I guess it's like Nixon compared to Bush. Unfortunately these two are like skunk stink. Very hard to get rid of. What's needed is a mass boycott or walkout as they've had in most major league sports. Toyota's talking about leaving. I think things might get interesting soon. This crock about saving money won't work. As long as an F1 team has access to more money than another, they will spend that money making their car go faster. If the engine, chassis and aerodynamics are frozen they will find other ways. Colin Chapman once said the rules don't matter. We will always find ways around them to make the cars faster, and that is where any and all available money will go, no matter what the bufoons try to do about it. It is the nature of the beast. I don't normally comment here but this post seems way too optimistic. If the Canadians were the ones in a panic as you say and they asked for talks then how is anything in their favour? As for the older European Grand Prix, Bernie would be only too happy to get rid of a few more. I don't think he's at all bothered by the French cancellation or what they gave as a reason for the decision. Why do you assume that he would be at all bothered by the prospect of 1 or 2 years with only 16/17 races. Once the new countries are ready it will mean the older European races will be lost to us forever, and that is NOT something worth waiting for. I agree. For years Bernie has been trying to get the British government involved in the British GP, though so far they have been too smart to fall for that. I think he is hoping Donington will come up well short and the government will have to step in to save the race. He has succeeded in involving the Canadian government now, that seems like a victory to me. He likes dealing with governments, they have very deep pockets and he understands how politics works. I see no silver lining here. It's not so much the question of being with only 16/17 races for a couple of years as it is the couple of years the 16/17 races are in. The Royal Bank of Scotland (which holds the $2.9bn debt to Bernie) is in such serious trouble that the British government had to buy 63% of it to keep it afloat. This has meant politicians on the board, and those politicians will need vast amounts of money to justify the taxpayers' money spent on it. Especially since the politicians are Labour, there's a general election due on or before 1 May 2010 by law and Labour are currently well behind the Conservatives in the polls. With the economy (the main plank of Prime Minister Gordon Brown's strategy) due to be in a mess throughout that time, a ray of hope is needed for Labour to save themselves, since they appear to lack the imagination to change tack with their broad political strategy. They need a big payout to save their position and the $2.9bn F1 owes them would be a very useful vote-winning device. All Gordon Brown's emissaries to the RBS have to do is to say those five magic words, "We're calling in the debt". Labour would rise in popularity (particularly if it was done just before the general election got called), Bernie and the CVC would realise their entire strategy was wrong, those who really wanted to race in a top-line series would make one out of fresh cloth (probably minus the manufacturers but plus teams like McLaren and Williams) and the FIA would have egg on its face (and probably have to accede to the new series' demands for better governance, assuming the new series wanted to deal with it any more). Psuedopolitical thinking got us into this mess. Political thinking, strange as it may seem, may get us out again. The British government won't step in to save the British Grand Prix even if Donington falls flat on its face. The time it would happen (if it happened, which it might not) would be shortly after the Conservatives enter power (assuming the tactic outlined above wasn't enough to save Labour at the polls, otherwise the entire series would be in transfer at that point) and they would be extra-keen not to get involved in anything even slightly smelling of sleaze. Especially with people such as Bernie Ecclestone who are already partly responsible for Labour's unpopularity. The tobacco affair of 1997, where Ecclestone donated $1m to Labour and had it returned after it was revealed, returned to the news last week and it was revealed that there was a suspicious change of policy shortly after the meeting where the donation was made. There is no evidence to say that Ecclestone actually told Tony Blair to change his policy, but even if it emerges that the policy change was all Blair's idea, it will make Labour look distinctly... ...eager to please. The Conservatives are currently using that, plus a controversy involving another Labour politician and a yacht-owning Russian, to make it look like Labour is as corrupt as they were at the worst of their governance in 1996/1997. Shane: What is different about the situation with the Canadian GP is that, bot only did the Canadians rush around in a panic, but Bernie agreed to meet with them and attempt to reach agreement. Once he has decided a race is off the calendar, Bernie does not usually bother with talking about it anymore - in this case, I think the sudden disappearance of the French GP has forced him to be more reasonable as he needs a GP to fill its slot. The reason why he needs more that 16 or 17 races is that his employers, CVC, have huge loans to pay back and they must have the income from F1 to meet their commitments. The more races Bernie can squeeze into the calendar, the higher the income from them, and vice versa. He has been expecting there to be 18 races in 2009 but that figure is now down to 17. That messes seriously with his financial calculations and even reduced income from the Canadian GP has got to be more attractive than nothing. Lonny: I agree that Bernie would like to get national governments involved in paying for GPs - ultimately, this looks like being the only way he will be able to continue to charge his ridiculous prices. But he also knows that the British and other govts are not going to play ball. He may make noises about them contributing but there is no chance at all that they will spend taxpayers' money on what they regard as a minority sport. It may seem a coup that Bernie has the Canadian govt officials talking to him but he is really no further forward if his aim is govt funding for the Canadian race. They are there to broker a deal for the organizers and will not be committing govt funds to the venture, I think. Bernie is talking to them because he had not realized what a storm of protest would break out over the cancellation and because he finds himself with fewer GPs than expected. The organizers will get their deal. Alianora: Another exhaustive consideration of the problem facing F1! Not being a political animal, I try to avoid the overspill into national politics but I'm sure your assessment is largely true. What it all means, however, is that there are pressures on Bernie that we do not appreciate and his freedom to act just as he pleases is seriously curtailed. And that is a minor victory for us, at least! Another factor to consider is the state of the world economy. While oil prices were high, the Arab states had no problem justifying spending outrageous sums in sponsoring F1 races and facilities. It would appear this situation may not continue. Also, sponsorships from financial companies look to be very much in jeopardy. Where are the new sponsors going to come from? Clive: Mike Lawrence has a most interesting take on this on his blog on Pitpass.com. Well worth reading. Yes, I've read it already, Don - Pitpass is one of my regular ports of call each morning. Mike Lawrence is a good writer, although I don't always agree with his take on things. This most recent article is a cry of pain more than anything else, lamenting the way F1 has been bought and sold by people who care nothing for the sport. He is right but there is little we can do about it except continue to make our views known. I find it quite funny that bernie now owes the British tax payers a large sum of money. Doesn't that now mean that he is ours to do with what we like? Gollum has lost his precious. He also now owes me £31 plus interest. Oh, that we could indeed call in the debt!